iTunes videos are great when all you want to do is watch them through iTunes. But what if you want to watch the movies you purchased or rented on iTunes on other devices? Tuneskit DRM Media Converter for Windows makes it possible. Tuneskit DRM Media Converter for Windows is a nifty piece of software that’s a must-have for all iTunes users. With its help you can remove Fairplay DRM protection from the files you’ve downloaded from iTunes, convert them to popular video formats and watch them on any device. You may be asking yourself why you need to use DRM removal for Windows in the first place. The answer is easy. The content you purchase through iTunes becomes yours but DRM protection prevents you from watching it on non-Apple devices. But what if you want to watch the movie you bought on a non-Apple TV or on a Windows computer? Without DRM removal and conversion, that’s impossible. But with this app from Tuneskit you can make your content watchable on literally any device. So go ahead and download the free trial version to give it a test run. This DRM media converter for Windows has all the necessary features for really fast and efficient media files conversion. The best thing about it is its speed, which is 30x faster than its competitors. Converting a full movie and removing its DRM protection literally takes minutes. All you need to do is select and import videos in Apple’s DRM-protected m4v format, configure output settings such as output format, audio and subtitles (you may choose to download only the audio track and the subtitles that you need), and click on “Convert”. The Tuneskit software will quickly process the videos and remove all DRM protection so that you can watch the videos on non-Apple devices. In addition to speed, Tuneskit has another important benefit. When it converts m4v video files to mp4, it does so losslessly. This means that the quality stays the same. That includes audio and subtitles, too, because Tuneskit DRM Media Converter for Windows keeps AC3 5.1 surround sound, stereo audio, subtitles and other bells and whistles. This DRM Media Converter for Windows is amazingly easy to use. Its interface is clean and intuitive, and so are its features. It supports drag & drop, which makes it easy to add files for conversion. I really liked that it keeps the path to the output folder clearly visible and easy to change. Some software “hides” your files in folders it creates so that you have to look for them later. But Tuneskit keeps things nice and easy. Tuneskit DRM Media Converter comes with a free trial. The full version costs $44.95. That’s not cheap but if you think how much money it can save you by helping you remove DRM from your iTunes videos, you’ll see that it’s worth the money. 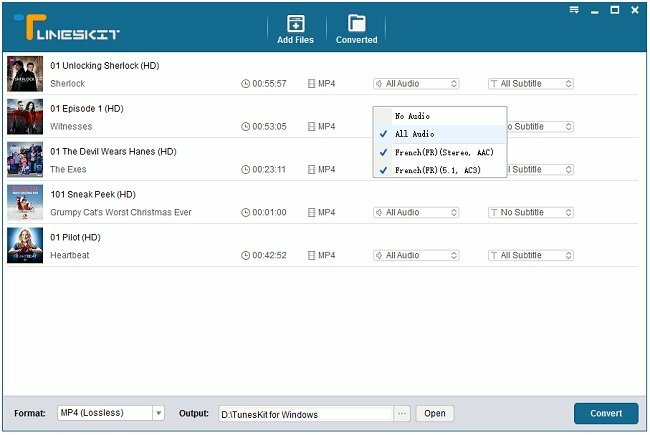 Tuneskit DRM Media Converter for Windows is a nice app that takes the hassle out of watching iTunes content on non-Apple devices. If you are a regular iTunes user, then this app is definitely recommended.